Controlling Small Hive Beetles in beehives is a serious concern for many Southern beekeepers. Better management practices and maybe hive beetle traps are our first lines of defense. If you are a beekeeper who does not know what Small Hive Beetles are – that’s great, maybe you don’t have them in your area – yet. But for many of us, Small Hive Beetles are something we can not ignore. This is especially true for beekeepers who live in warmer regions where Small Hive Beetles become a big problem – year round! I know beekeepers who have lost many hives due to beetle infestations. Does this mean you should “freak out” when you see a Small Hive Beetle? NO. But you should take note of their presence and watch for problems. A few beetles are nothing to worry about. But, heavy infestations of Small Hive Beetles can take down even a strong bee colony. One of the most common ways of dealing with hive beetles is the use of traps. Sometimes they work well and other times – they do not. This is the Beetle Blaster . I have some of these traps. They are filled 1/3 full with any type of vegetable or mineral oil. Then places between the wooden top bars of the frames. As with all traps, sometimes I have success with these and sometimes not. They can be messy due to the oil inside – be careful. Do not spill the oil inside the hive – it will kill bees too. The beauty of this trap is that it is inexpensive and disposable. In a previous post, I discussed the some of the problems posed by Small Hive Beetles – a relatively new pest for beekeepers in the US. In short, adult Beetles fly into the bee hive and lay eggs. The eggs hatch into beetle larva. It is the larval phase of the Small Hive Beetle that causes damage. Attempting to use hive beetle traps for larva doesn’t work, but it is the beetle larva that cause problems inside the hive. Small Hive Beetle larva eat honey comb and can cause major damage to the colony. The wastes of the larvae cause honey to ferment. Sometimes fermented honey will even run out of the hive. When the hive beetle larva reach a certain size, they leave the hive and burrow into the soil. Here they pupate into adult beetles. And, the cycle begins again. We can not control the larva. So, we want to control the number of adult egg laying beetles in the hive. If no eggs are laid, no larva will develop. Alas, keeping Small Hive Beetles out of the beehive is not an easy task. Their small size offers challenges when trying to keep beetles out and let honey bees inside. Our best strategy seems to be having a strong bee population inside the hive. The worker bees will chase and harass the adult beetles. Hopefully preventing most of them from successfully laying eggs. Why Don’t Bees Sting the Beetles? Honey bees can sting. The stinger is an effective method of hive protection. However, the bee stinger can not penetrate the hard shell of the Small Hive Beetles. Why Don’t the Bees Throw Hive Beetles Out? Small Hive Beetles can “hunker down” and tuck in their head and legs. The best our bees can do is to corral the beetles into corners. Here, the worker stands guard and prevents the beetles’ escape. The best treatment for small hive beetles is a plan that stops the issue at the adult beetle level. Small Hive Beetle larvae are small white grubs. Similar in appearance to the larvae of the Wax Moth, beetle larva are the smaller of the two. It can be difficult to identify the correct larva type when they are small – but they do have differences. If you look closely, you can see a slight physical difference between the wax moth larva and beetle larva. Small Hive Beetle larva have numerous spines along the body and 3 pairs of distinct legs on the anterior end. Again, we want to control the number of adult beetles in the hive to prevent a beetle larva. Once beetle eggs begin to hatch, larva grow quickly. A large population of beetle larva can take down a beehive in just a few days. Weaker honey bee colonies are more at risk because they have fewer bees to patrol the comb. As the hive beetle larva grow, they move across the comb eating honey, pollen and baby bees. Their feces causes honey to ferment and become slimy. If conditions get really bad, your whole colony of bees may decide to abscond or leave the hive. 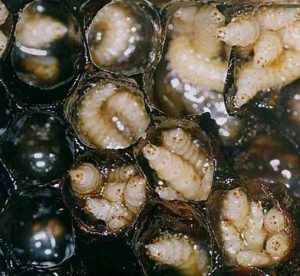 Any Small Hive Beetle treatment plan must consider suppressing larva development – long before it gets out of hand. Our target is the adult not the larva. Wax Moth Larva or Small Hive Beetle Larva? Because new beekeepers often find it difficult to distinguish between Wax Moth larva and Hive Beetle larva – they may not identify the problem correctly. Some of the same situations, like a weak hive low in population, can result in an infestation of either pest. But it is good to know exactly what we are dealing with. Wax Moth larva have no spines along the underside of the body and their pro-legs are less developed. Small Hive Beetle larva have spines and developed front legs. But there may be another clue inside the hive. Do you see any webbing ? Like a spider-web? If I see a lot of adult beetles in the hive and no webbing (left by wax moth larva), its a beetle problem. Yes, it is possible to have both types of larva in a hive at the same time. Neither type is a good thing to see inside your bee hive. But do not panic if you see just a few of either kind. There are things that we can do to help prevent a need for hive beetle traps or treatments. Poor management practices can encourage beetle infestations. While working in the bee yard, don’t throw down bits of wax and other hive debris. This practice attract beetles, skunks and other predators. And the aroma, encourages beetles. Keep bottom boards clean of hive debris. As the colony goes about daily activities, bits of wax, pollen, etc will fall. Beetles will lay eggs in the debris. Periodically clean any accumulated debris off your bottom board. Otherwise, you will have beetle larva growing inside your hive on the bottom board. Adult Small Hive Beetles prefer hives in shady locations. Therefore, placing hives in the sun may be of some benefit. Here in South Carolina, I place my hives in full sun. It gets hot! But the hot, red, clay soil discourages larva development. Fewer larva survive to pupate in the hard dry soil. I am a big fan of placing beehives on stands. It is easier on your back while managing your hive. And, it is easier to keep the area around the base of the beehive clean. Commercial stands such as the Ultimate Hive Stand is very sturdy and a good choice for beekeepers who don’t want to build wooden stands. Some beekeepers also use cement blocks to create a raised platform for their bees. Keep the ground around your hives clean and dry don’t use mulch. This is another reason that proper hive placement is so important. That said, I have had beetles in my sunny hives. But my friends with beehives in the shade had a more difficult time. Have you recently harvested honey? Yum. Extract the honey within 1 – 2 days. Small Hive beetles or eggs may be present on the comb. If you fail to process your honey and store it in a sealed container, you may loose the crop. Unseen beetle eggs can hatch and beetle larvae will ruin your hard-earned harvest. A honey bee hive can manage a small population of beetles. It is not necessary to remove every single beetle from every hive. However, you don’t want to ignore a growing beetle population. Worker bees will chase the adult beetles to prevent egg laying. This trait makes the use of Hive Beetle Traps something to consider. The beetles run into the traps to escape worker bees. Sometimes, beetles will be cornered by the bees. When you inspect a colony, always look quickly at the corners when you separate a box. Squish any beetles you see. Don’t keep weak hives. While strong hives can mount a good attack on beetles, weak hives are quickly overrun. Keep populations large enough to patrol the complete area inside the hive. Resist the temptation to “over-super” your colonies. Beehives with a lot of boxes must have a large enough population to patrol all of the comb surface. If you have a colony with a large Small Hive Beetle infestation, don’t split it into 2 parts. You will have 2 weak colonies with a beetle infestation already in place. Once the beetle population grows, no amount of hive beetle traps will be able to make a difference. Match hive space (the number of boxes you are using) to your bee population. Checkmite+ (coumaphos) is an approved treatment for Small Hive Beetles. The chemical strips are placed inside small boxes with slits. Considered a “hard” chemical, I don’t know any beekeepers who use it. Guardstar is applied as a soil drench that prevents larva development. Application may last 30 days depending on soil type, ph and rain. It is not effective in areas with a lot of rainfall. Some beekeepers have used a mineral salt (made for livestock) and water spray in the same way. If beetles are a big problem in your area, you many consider the use of nematodes. Beneficial predatory nematodes are commercially available to add to your soil. This method has not worked well in my hard clay soil but you may have better results where you live. You can not use any nematodes – some varieties do a better job of grub control. Nematodes may help control the develop of more adult beetles by killing them in the grub stage. But they will not kill the adult beetles that are already in the hives. There are so many hive beetle traps, rims and shims on the market that I won’t name them all. The goal of any hive beetle trap is to lure the adult beetle inside – hopefully before she lays eggs. Some hive beetle traps use compartments with mineral oil to trap and suffocate beetles. An attractant such as Apple Cider Vinegar may be used. I have not found “bait” or attractants to work well in my area but you may want to give it a try. Popular Hive Beetle Trap Choices: AJ’s Beetle Eater , Cutts Beetle Blaster, Beetle Jail (my favorite) – all these hang between the frames. Beetle Blaster Traps are easy to use and disposable. Some years I have good luck with them – sometimes not so much. But, they are work a try. Fill the chamber 1/3 full with any type of vegetable oil or mineral oil. Be careful – don’t spill oil in your hive. I have a love/hate affair with beetle traps. Some times they work well and then months go by with no trapped beetles. I have tried all of the most popular small hive beetle traps. Currently, the Beetle Jail is my favorite. It is re-usable. I like that I can clean it out and use again – 1 less piece of plastic to throw away. 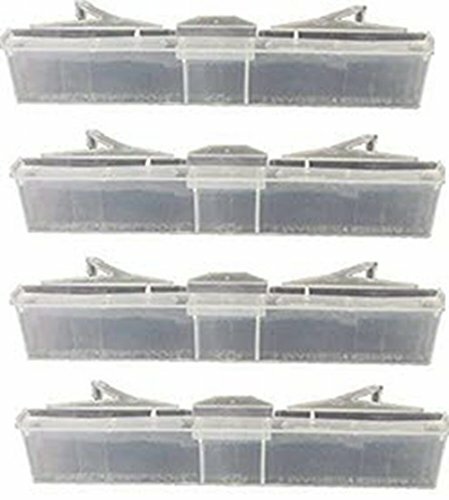 It is a sturdy made trap and sits recessed between the top bars. I use a small amount of vegetable oil in mine and usually do not use bait. (apple cider vinegar/pollen) But you can use bait if you wish. Beetle Jail traps are reusable. They hang between the top bars and are easier to manage than some of the traps. Fill the chamber 1/3 full with any type of vegetable oil or mineral oil. Be careful – don’t spill oil in your hive. Some beekeepers experience success with oil traps placed under the hive. These trays (with oil inside) are placed under a screened bottom board. 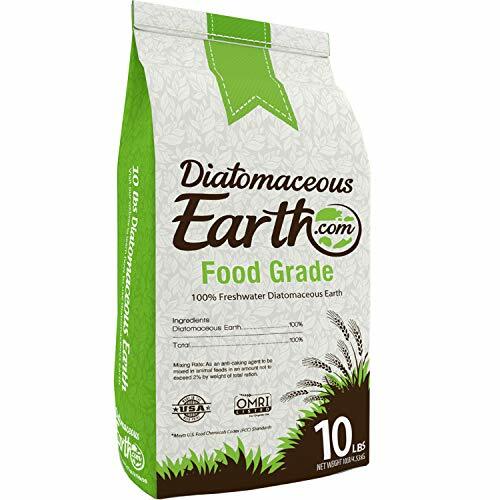 DE – Diatomaceous Earth can be used for many things about the homestead. Beekeepers use it inside hive beetle traps or applied to the soil around the hive. But, don’t forget that bees are insects too! DE will kill your bees if they get it on them or inside the hive. Use it if you want – but use it with care. It is often used as a dust on the ground around the hives – or placed in “oil” trays under the hive. Just remember – we dont want this dust to end up on the landing board of the hive or on the bees. A newcomer in Small Hive Beetle traps is the use of pads. These pads are placed on the top bars inside the hive. The bees try to remove the pads from the hive. This causes the material to become very fuzzy. Adult Small Hive Beetles become trapped in the fuzz -but most bees escape. There are several varieties in use. Beetle B Gone is a commercial beetle pad that can be purchased through bee suppliers. I have by used them and they do work but a few bees will be caught as well. Some beekeeper express success with the use of unscented dryer sheets as hive beetle traps. However, keep in mind that we do not know the effect on the bees from other chemicals in the sheets. 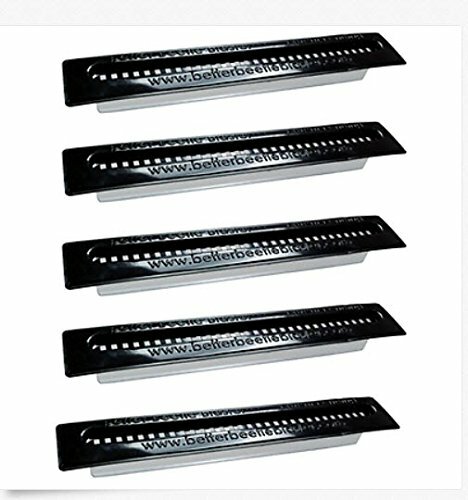 With few ( if any) chemical treatments or consistent hive beetle traps – that stop hive beetle problems and have no risk of harm to the bees …. we are left with trying to control beetle issues. Prevention is the smarter plan to use. Get to know your enemy – the Small Hive Beetle and do what you can to minimize the problem. Research has demonstrated that an aqueous solution of 60% formic acid significantly reduces SHB infestations. Have you tried this substance out? No I have not. Some research has hinted at Formic as a possible option in dealing with Small Hive Beetles. However, the studies have not shown it to be a consistently effect treatment. More studies must be completed from different researchers in other climates before we can embrace this idea. The MAQS are used according the directions on the label. I understand your problem but I would never put ant poison in my hive. I know some folks do but it is just not something that I feel comfortable doing. We are in the Midwest. This year, the Japanese Beetles seem to be pretty bad. In the past, we have used Japanese Beetle traps to draw these little buggers away from our trees and flowers. Will using these impact our bees? No they should not bother your bees. Will MAQS treatment for varroa reduce the number of beetles?? I live in FL and hive beetles are bad. Some people report that MAQS will aid in hive beetle problems. However, your best defense is having hives in full sun (or at least have the ground dry around the bottom of the hive to inhibit pupation.) and keep a lot of bees in your boxes. Too many boxes with not enough bees to patrol is a big problem. My hive had several small black spiders under the cover in little cocoons. Do they eat SHBs? Or, should I get rid of them? Thanks for your response. If they were spiders, they would be more of a threat to the bees than beetles. I would think. We lost several hives to SHB. We had beetles traps baited with vinegar and mineral oil in each box and beetle baffles on the bottom of our hives. As a last resort we ordered the nematodes. They worked within about 1 week. We apply about every 6 months, and rarely do we ever see any SHB. Our hives are in full sun. Thats wonderful. Nematodes have not worked well in my red clay soil. I am glad you found a way to manage small hive beetles in your bee yard! We live south of Atlanta so we also have hard red clay. We rough the soil up around the hives and they have now been working over a year. Still only see about 1 per inspection. My friend also had a terrible infestation a month ago. She ordered and applied the nematodes and within two weeks we only saw 1 or 2. We order ours suspended in gel and hers were in a powder. Both worked well. Thanks Susan, that is really good to know. I will give it a try.